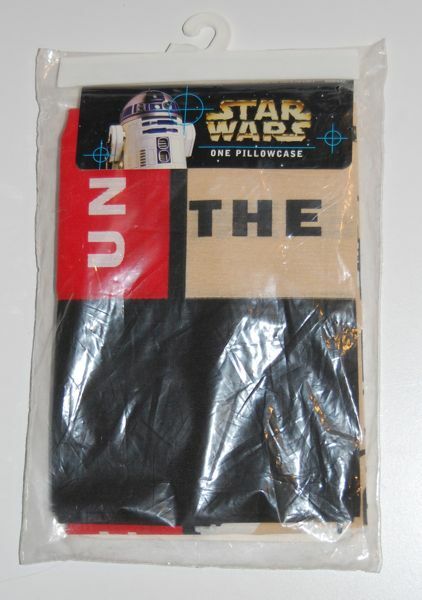 Westpoint Stevens made a couple of different types of Star Wars bedding sets in the mid 1990s. One was the “Character Study” style that featured black and while photos of various characters in a sort of pointillistic style reminiscent of newsprint. That set had Jabba on the sheets, and they also sold a separate pillowcase with just Jabba and Boba Fett on it. You can argue that it doesn’t make much sense to have Jabba or Boba Fett over an imperial symbol, since neither one of them was actually a part of the empire, but I guess we can overlook that. I don’t find this design as attractive as the “Character Study” style, though, and the pillowcase itself seems rather rough (but maybe that’s because I haven’t washed it yet). I got it new in the package, but since you couldn’t see either of the characters in that state, it seemed silly to leave it that way. Interestingly, the same drawing of Jabba was also used on this Return of the Jedi baseball cap by Fresh Caps.